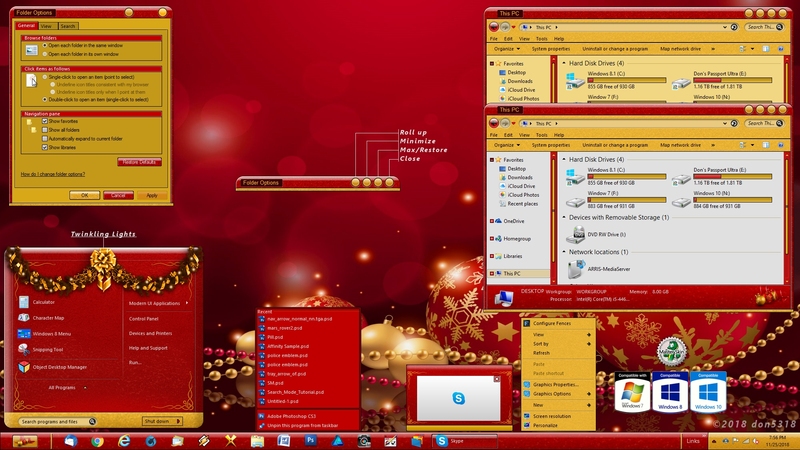 Another holiday skin called Xmas Holiday, has sub styles for Win 7, Win 8.1, Win 10, light/dark Explorer background, roll up button, and twinkling light animations in the start menu, enjoy. Great WB Don. Will brighten up the Desktop perfectly for the Holidays. I received this as a gift....sure is pretty, and festive. Thank you cardinalsyn_25, I'm glad you like it. Fantastic xMas skin Don, great job! Don, This is one helluva Christmas gift!! Thanks, man! Thank you Vicki, back at you.